Richard Curtis might just be the most romantic man in the world. After all, the 57-year-old Brit has written and/or directed several of the most successful romantic comedies to adorn cinema screens over the last 20 or so years. As a writer, Curtis started his career on television comedies such as Not the Nine O’Clock News and Blackadder before broadening his horizons into motion pictures with his screenplay for the underwhelming The Tall Guy. However, from this point, Curtis struck gold with scripts for Four Weddings and a Funeral, Notting Hill and Bridget Jones’ Diary. He upped the ante in 2003 when made his directorial debut with yet another hugely successful romance in Love Actually. Since then, Curtis has penned screenplays for the Bridget Jones sequel and Steven Spielberg’s War Horse and well as writing and directing The Boat the Rocked, an ensemble comedy that failed to harness the affection from critics and audiences that is deserved. With About Time, Curtis returns to what he does best, helming a romantic comedy that, whilst taking its cues from his earlier work, does offer something a little different. On this occasion, Curtis has introduced a science-fiction element into his otherwise typical boy-meets-girl-and-overcomes-all-obstacles-to-live-happily-ever-after narrative awash with eccentric British characters and cool music. Taking over from Hugh Grant on leading man duties is the relatively unknown Domhnall Gleeson, making the step up from supporting roles in the likes of Never Let Me Go, Anna Karenina and a couple of the Harry Potter films to play Tim, a decent and kindly bloke who enjoys a very happy relationship with his family, who spend their days lolling about their house on the picturesque Cornish coast. .
Of course, it goes without saying that our hero is awkward around women so when, on his 21st birthday, he is told by his father (Bill Nighy) that all the men in the family can travel back in time to revisit moments in their own lives, Tim’s immediate reaction to his newfound power is to identify its value in helping him to secure a girlfriend. Before long, Tim’s quest begins to bear fruit when he, quite literally, bumps into Mary (Rachel McAdams) at a restaurant in which customers dine – somewhat bizarrely – in total darkness. As their relationship develops, Tim uses his gift to correct those moments that don’t really go according to plan and thereby sell himself as being much more competent and confident than he really is. This does raise questions about the authenticity of their relationship given that the Tim with whom Mary falls in love is somewhat different to the ‘real’ version. He manipulates events so that she really has no choice, so you probably need to be able to accept Tim’s actions as romantic rather than creepy to enjoy the film. The charm of the film lies very much with the cast, in particular the two leads. Gleeson is charming as Tim and McAdams, who has never looked better on screen, is delightful as Mary. Despite the contrived nature of their coupling, there is an authenticity in the performances and the relationship feels real. As the family patriarch, Nighy is great fun, even in the darkest moments of the film, while Lindsay Duncan doesn’t have a lot to do as Tim’s mother. As expected, there is a gaggle of ‘quirky’ supporting characters, while a secondary narrative thread centred on Tim’s sister Kit Kat (Lydia Wilson) only serves as a distraction because her strange behaviours are never really explained satisfactorily. 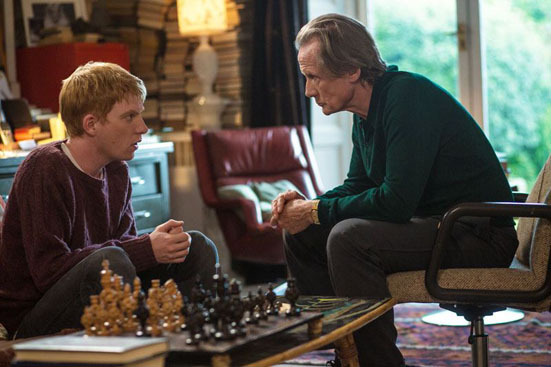 Whilst there are several moral questions posed in About Time, Curtis seems much more interested in using the time-travel element simply to propel the narrative and as the basis for some of the best comedic moments. With a plot that is Groundhog Day meets any other Richard Curtis rom-com, there are enough laugh-out-loud moments to overlook the lack of logic in the premise and other distractions, such as the completely unnecessary use of hand-held camera. 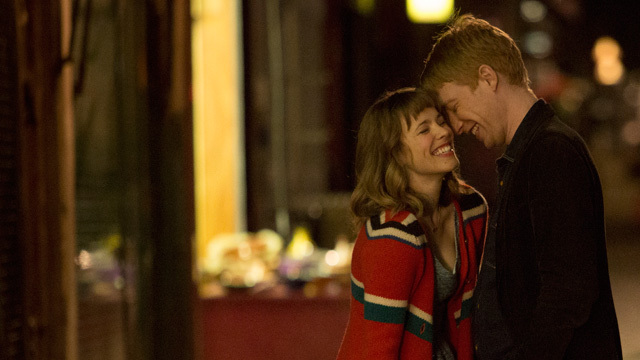 Perhaps it drifts into over-sentimentality at times but, overall, About Time is a sweet romance that should to raise a few laughs from even the most curmudgeonly amongst us.